The 98-passenger MS Treasures is one of eight ships in the fleet run by the U.S.-based tour operator Tauck, which was started in 1925 and is now headed by the third generation of the founding family. 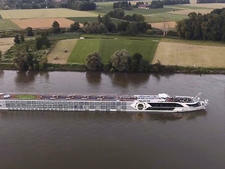 In common with its other vessels, MS Treasures was constructed to Tauck's specifications by its partner organization, the Swiss river ship builder Scylla. 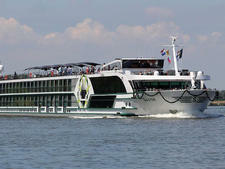 It provides a luxury all-inclusive cruise with meals, drinks, excursions and gratuities included in the fare. First launched in 2011, MS Treasures underwent a radical "down-to-the-studs" refurbishment for the 2018 season; most notably reducing the passenger capacity by 17 percent. The 30 original 150-square-foot cabins on the middle Ruby Deck were replaced by 20 cabins measuring 225 square feet; reducing the total number of cabins from 59 to 49 and the number of passengers from 118 to 98. The low numbers create a very boutique and intimate onboard atmosphere. The other main enhancement can be found in Arthur's, the ship's second dining venue previously called The Bistro. It has been upgraded with its own dedicated kitchen and chef and features an expanded menu that provides a casual dining alternative to the main restaurant. MS Treasures is beautifully fitted out in an elegant yet contemporary style and the scene is set by the extravagant marble-floored lobby, which is topped by a glittering chandelier. The 49 cabins comprise standard staterooms in five categories and one category of suites. The new configuration, plus flexible dining times, gives the ship a very spacious ambiance and it never feels crowded. Passengers can expect an extremely high level of personal service from crew members that include three directors (by contrast most other lines have one cruise director) who are always prepared to go the extra mile without a moment's hesitation. For example, on our cruise, the maitre d' brought in a specific type of wine that we mentioned and when our traveling companion asked if it would be possible to go to the hair salon on the larger Tauck ship MS Joy -- moored alongside in one port of call -- this was arranged. Solo travelers, who often have to pay hefty single supplements, get a great deal with Tauck. On each sailing the eight lower deck category 1 cabins can be booked by single passengers with no additional supplement -- one of the reasons Tauck attracts a significant proportion of repeat passengers along with travelers who have previously been on the company's land tours. 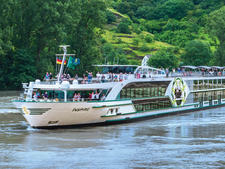 MS Treasures sails on the Rhine, Main and Danube, including the 14-night Budapest to Amsterdam itinerary taking in all three rivers and five countries. The majority of passengers are North Americans over the age of 55 who are well-educated, well-traveled professionals, boomers and seniors with a keen interest in culture and history. 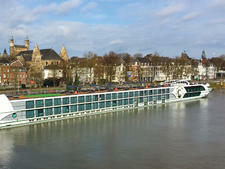 Many of them are very loyal to the Tauck brand -- on our sailing one passenger had been on 19 vacations with the company. There is a mix of couples, friends and occasionally multigenerational groups with younger members of the party generally in their early-20s or above. You can expect a higher than average number of solo passengers due to the number of cabins available at no single supplement. This creates a very inclusive onboard vibe. Tauck sell cruises in other English-speaking countries so you can also expect to meet a smattering of Canadians, Australians and passengers from the U.K. There is no set dress code and passengers are advised to dress comfortably. Jeans, casual pants, T-shirts and sweaters are ideal for shore excursions, and comfy shoes or sneakers are a must, particularly for walking in historic European towns and cities where there are cobbled streets and uneven surfaces. Weather in Europe can be changeable, even in summer, so it is a good idea to bring layers, plus a hat and rain jacket. Evenings tend to be smart casual and most people change into smarter pants or chinos for men and two pieces or dresses for women. For dressier occasions, such as the captain's farewell dinner or evening out at a concert, some women wear party dresses and men put on dress shirts and jackets. Tauck offers an all-inclusive cruising experience and fares cover all meals and snacks, excursions, unlimited soft and alcoholic beverages aboard the ship, Wi-Fi and all gratuities to the ship staff -- including the Tauck tour directors -- local guides and drivers. All excursions are conducted with audio headsets so passengers can hear what the guide is saying without having to cluster around. Listening devices and earpieces are provided in every cabin. The onboard currency is the euro. Onboard accounts can be settled in euros or by American Express, Mastercard or Visa. Tauck's pricing include gratuities for ship staff (and hotel staff if there's a land stay), local guides and drivers, Tauck directors and the cruise director. If somebody delivers exceptional service and you'd like to give a little extra -- maybe to the bartender who makes you perfect martinis or your steward who goes the extra mile to fulfill a request -- it's always appreciated. Be sure to have some euros with you for this purpose, as cash is not handled onboard. Chartered for the 2017 cruise season, Jewel provides Tauck's customary high level of service, in a contemporary elegant surroundings. 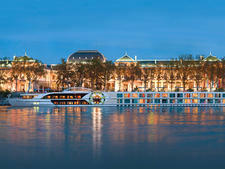 Tauck’s all-inclusive Joy, introduced to the fleet of European vessels in 2016, operates a range of itineraries the Danube River. 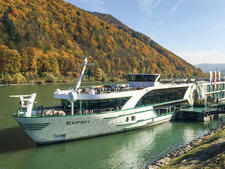 Sailing the Rhine, Main and Danube Rivers, Tauck's 118-passenger Esprit is full of luxurious features, including spacious suites with walk-in closets and marble bathrooms with full-size tubs. Renovated in 2017, ms Sapphire offers a truly all-inclusive experience with luxurious amenities, outstanding service - the ship has only 98 passengers - and a quiet professionalism. Attracting an international clientele, Tauck stands out from the pack on Europe’s rivers with its all-inclusive offering, casual elegance and sophisticated vibe. Inspire is a gorgeous boat -- all shining brass and sparkling crystal, but its opulence isn't offputting. Instead, from the minute you step onboard, you feel welcomed. 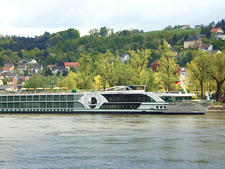 Tauck River Cruising's 130-passenger ms Savor sails on the Rhine and Moselle rivers, and sports "loft" design cabins, alfresco dining options and bikes for passenger use. 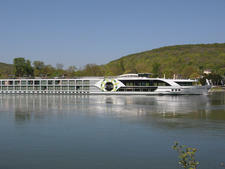 Emerald, launched in 2006, is the first ship custom-built for the Tauck river fleet. It's beautiful without being ostentatious, and very destination focused.